With a serious stellium (Sun, Moon, Pluto, Mercury, and Venus) in Capricorn (not to mention the last hours of a waning moon) at 0:00 AM 1 January 2014 (GMT), the prevailing energy of the entire of calendar 2014 for everyone will be one of Strength. Without renewed passion, this year you will not be able to continue in your chosen direction. You will have difficulty enduring the challenges and could be forced to drop back and regroup. 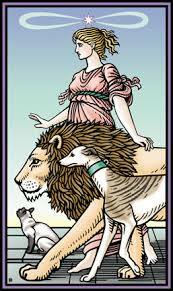 Because the Strength card relates to Leo, this year your experience a ‘lust’ for creativity and self-expression. Like the sap rising in spring, life-force surges through your veins. Hopefully you will direct this passion into meaningful projects and not waste it or worse – allow it to convert into a destructive force. In ritual magic, this is akin to raising a ‘cone of power’, which when released must be directed toward a specific purpose else it wreaks havoc. During the whole of 2014 you’re called to look carefully at what you’re doing because quite honestly, you will be ‘playing with fire’. Like fire, your emotions can be a great civilising force or a source of destruction. The key to getting this right is to embrace what you feel to be ugly or beastly in yourself, because in a year of Strength, is only through acceptance that you build character. 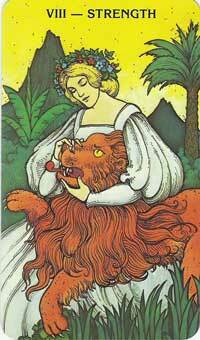 You will be challenged to persevere through difficult situations perhaps in career, health, or family. You will be challenged to balance your needs with those of the people you love. You will be challenged to stick with it no matter now rough the going gets because this is the only way to discover what it is that you really want. Keep a piece of pink wax with you in a sealed envelope to help you remember your pledge. Thank you so much for stopping by and listing my post 🙂 have a blessed day!